When I cook for a large annual picnic in August, I always want to serve local corn but it’s a pain to grill or boil it on the cob. 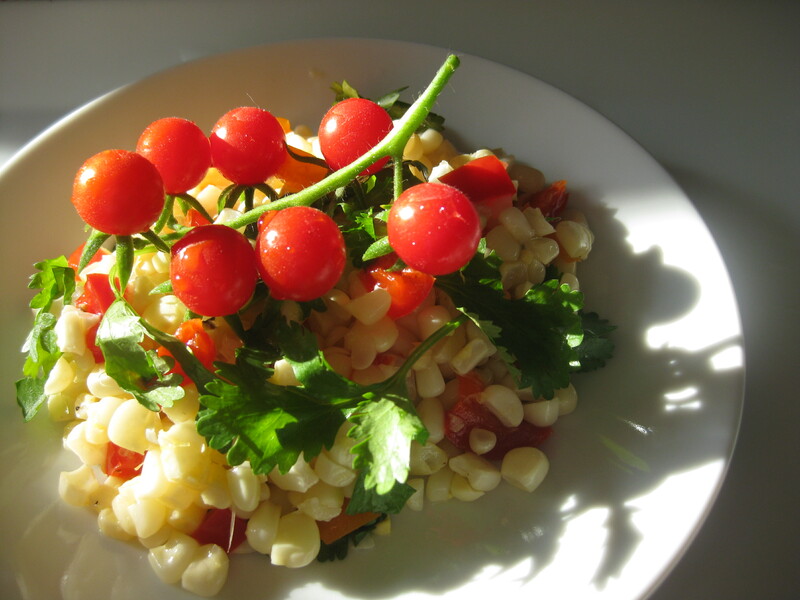 And yet I want it to be as fresh and sweet as possible, so I devised a salad of barely cooked corn cooked at the last minute and tossed with a multi-colored pepper salsa. The corn stays pure and the seasonings come with the salsa… subtle, refreshing and delicious. I make the salsa in advance, and let it sit for an hour or two. It’s made of red and orange peppers, and some red onion diced into ¼-inch squares, which are tossed with white wine vinegar and a splash of olive oil, and seasoned with salt and pepper. For the corn, cut it off the cob and cook it quickly – in batches — in a small amount of water in a wide pan. My batches are 4-6 ears depending on the size of the ears, so that the corn cooks in 2-3 minutes until warmed and just starting to cook through. Drain the corn, reserving the water and returning it to the pan for the next batch. (BTW at the end, you have a really flavorful corn broth.) Spread the corn as it cooks on a wide platter so that it cools relatively quickly. When cooled to room temperature, toss with the salsa, add a handful of torn cilantro leaves, mound on a platter and serve garnished with cherry tomatoes. The ones I show here are invaders in my garden by the million but very cute and tasty so I tolerate them. In a buffet, 2-3 dozen large ears cooked this way (plus a couple of red onions and peppers of each type and a bunch of cilantro) serves 60-70 people, so if you’re making this at home for your family, use just a few ears. Cook the cobs to make corn stock and add leftover corn plus some potatoes and cream to make a leftover corn chowder. Yum.